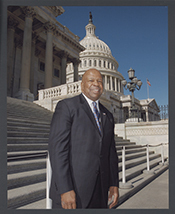 CUMMINGS, Elijah Eugene, a Representative from Maryland; born in Baltimore, Md., January 18, 1951; graduated from Baltimore City College High School, Baltimore, Md., 1969; B.S., Howard University, Washington, D.C., 1973; J.D., University of Maryland School of Law, Baltimore, Md., 1976; lawyer, private practice; chief judge, Maryland Moot Court Board; member of the Maryland state house of delegates, 1983-1996, and speaker pro tempore, 1995-1996; elected as a Democrat to the One Hundred Fourth Congress, by special election, to fill the vacancy caused by the resignation of United States Representative Kweisi Mfume, and reelected to the twelve succeeding Congresses (April 16, 1996-present); chair, Committee on Oversight and Reform (One Hundred Sixteenth Congress). "Elijah E. Cummings" in Black Americans in Congress, 1870-2007. Prepared under the direction of the Committee on House Administration by the Office of History & Preservation, U. S. House of Representatives. Washington: Government Printing Office, 2008.